When people ask us for suggestions for what to see in Umbria, we usually give them answers in pairs. What two things can you do in one day? Montefalco and Bevagna, one an historic hill town, the other an ancient settlement down below, both wine centers. From La Casetta Rosa, go to Montefalco in half an hour. Wander this beautiful preserved medieval walled town. Visit the linen shops, the wine shops, and the incredibly frescoed San Francesco church, which is a national museum. Stop for lunch in the main piazza or one of the many restaurants lining the street down to the crenellated city gate. After lunch drive down to Bevagna, where you will find the fountain where St. Francis (San Francesco) talked to the birds. There is a wonderful small museum and restored Roman baths filled with mosaics. Of course, there are wine shops and restaurants if you’d like to stay for dinner. If you’d like to be back at the villa by sunset, give yourself about an hour, particularly if the sunflowers are blooming and you want to stop along the way to take photos. 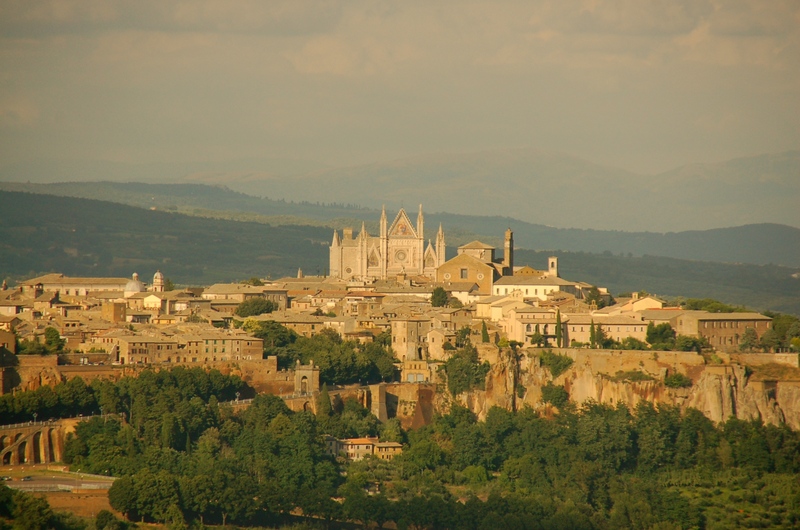 Another pair of towns to do in a day: Orvieto and Todi. Drive to Orvieto in an hour, along Lake Corbara. (See our parking tips for where to park). A must is the duomo on the main piazza, one of the most beautiful in Europe. The streets are lined with shops, restaurants and places for coffee and gelato. The Pozzo di San Patrizio is a fascinating place to explore, with its double helix staircase, used for bringing water up to Orvieto atop its tufa mesa. In the afternoon, it’s time for Todi with its impressive architecture. Wander around and stop for refreshments at an outdoor cafe in the main piazza, which is lined with grand palaces. We like putting together Assisi plus Spello, Trevi or Foligno. Spend the morning at the duomo of San Francesco and then wander the cobbled streets, stopping at other historic churches. Spello and Trevi are hilltowns a little less touristy than Assisi and both have nice options for lunch and wandering. Trevi has a good olive oil museum and Spello has art studios. Foligno is centered in the fertile valley below the others, a bustling market town where St. Francis sold his horse to finance his ministry. There is a great selection of boutiques and the main piazza has several options for lunch or an aperitivo. Is Perugia on your list? Stop off in Deruta on the way and marvel at the dozens of majolica ceramics studios. Deruta ceramics have been around for more than 500 years and are as beautiful today as they were then. There is a wonderful ceramics museum in the city center. Then, onward to Perugia, the capital of Umbria and a city with a long history. Take the Mini Metro up to the center and stroll Corso Vanucchi, the main street. The excellent National Museum is at the end with the stunning round fountain. Along the way there are shops and restaurants. We promised to do a post about parking in various Umbrian towns because so many visitors come by car and then don’t know where to park. We don’t know everything and we are ready for input from anyone who has a better idea to offer. For now, here are some hints.